More doesn’t always mean better. You do not have to dress up in an onion-like manner to keep warm, but you have to select your cold weather clothes carefully. Speaking physics-wise, your clothes should help you to keep an air layer between you and the outside, and absorb sweat. Air does not conduct heat, while liquid (sweat) does. First, select natural fabric only – cotton and wool are the best. Synthetic fibers do not keep the warmth of your body and got stunning cold when contact with the outer air. Select natural fabrics for your underwear too. Nylon/Lycra pantyhose looks great, but girls are at high risk of exposure to their legs while wearing it when the temperature is below zero (btw, scientists say that the risk of cellulite increases when legs are permanently being over-cooled). Your hands would thank you if you buy wool gloves/mittens for them. Do not forget to protect the throat with the scarf and/or high fur collar. The slogan “I’d rather go naked than wear fur” doesn’t work in -40C. Nothing will protect your better from cold than long fur coat. Well, the second option is a parka. The longer your coat is the better. A fur hat is perfect for the cold and windy weather. You may use a knitted wool hat too, but you should select a thick one. 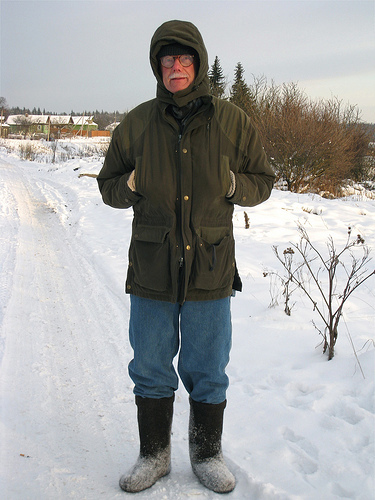 Fur boots keep warm very good, but genuine Russian winter footwear is valenki (in Siberia, we call them “pee´myh”). Nowadays, People in cities do not wear valenki, because this is a “peasant fashion”, however, I wore valenki throughout my childhood and was very happy. Do not wear tight clothes or shoes. Blood should circulate loosely, otherwise, you will get cold very quickly. Winter shoes should be one size bigger than your regular shoes. Merino wool is known and popular all across the world. In Siberia, however, dog wool is number one choice because it is warmer and softer than merino. Please, don’t think that there are thousands of shaved dogs in Siberia. We comb dog hair to get the thinnest underfur. It is widely believed that dog wool may heal rheumatism, arthritis and many other diseases. A regular Siberian winter suit is polo-neck sweater, jacket and skirt/trousers made of felt/wool, wool pantyhose for ladies and long underwear made of cotton for men, warm but thin socks, high boots, long fur coat/parka, fur hat, scarf, mittens. This is enough to feel fine even when it is so cold that your breathing turns into ice dust at the moment you breath out.